And you thought we fonly_ build supply boats. We build everything from crew- boats, tugs, fishing boats, patrol boats, lift boats, utility boats and femes to surface effect ships and amphibious landing craft with Bell Aerospace-Textron. And we have more diesel- electnc shipbuilding expenence than anyone m-our field. We offer complete m-house services from cost-free design and engineering to global war- ranty assistance. Should your vessel need modification or repairs, it can be done at our large dry dock. We even have a subsidiary to handle all of your spare parts requirements — promptly and accurately. Our six shipyards are staffed by shipbuilding experts who are supported by the latest tech- nology including computer directed metal cutting robots. 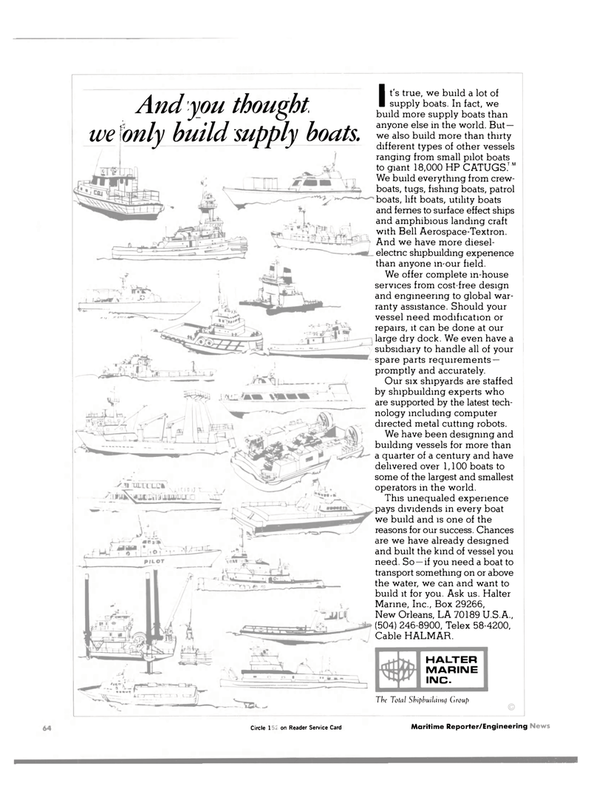 We have been designing and building vessels for more than a quarter of a century and have delivered over 1,100 boats to some of the largest and smallest operators in the world.